Another slow week this week! In a few weeks, I plan on buying books! yay! Summary:When her boyfriend dies a most untimely death, Aura--who can see ghosts--is forced to reconsider her relationship with the living and dead in SHADE. I don't read too much erotica but I read Swing and it was really good. It was more about romance and her best friend than anything. Summary: Hanna Lane wishes she could shed her inhibitions and unleash her wild side in the bedroom. When she meets J. M.--a Kama Sutra and Tantra master--they embark on a sizzling path of discovery, exploring the ancient sensual arts and discovering new techniques that allow Hanna to unlock her naughtiest fantasies and make them a red-hot reality. But when Hanna’s exboyfriend Grey re-enters her life determined to win her back, Hanna longs to share herself with both men. But can she tell J.M. and Grey her most taboo fantasy? And who will win her for keeps? Shade has been on my list for the past month! Can't wait for your review. ooh Shade looks good, can't wait to hear your thoughts. Happy Reading!! Shade sounds so awesome, and Blush looks pretty steamy, lol. I can't wait to read Shade and the erotica one does look good.... if nothing else, it does have a great cover. Happy reading! Shade looks good. The second one looks...steaming! Looking forward to Shade, as I love Jeri! Enjoy! I love Jeri Smith-Ready and I hope you enjoy her debut YA novel. I cannot wait for your review. Awesome books you got this week. Shade looks really interesting. Hope you enjoy reading all your books. Great books.. Blush sounds really good! Shade looks intriguing and Blush sounds HOT! :-) Enjoy! I'm looking forward to Shade because I have read her adult paranormals and liked them. 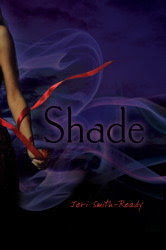 Love the cover for shade!